Have you ever needed to contact Facebook about an issue you're having? Like maybe you have a question about ads or privacy. Or maybe you're a parent trying to adjust the settings on your kid's account. Or maybe your profile got disabled for no apparent reason and you need help getting it back. In these cases, it sure would be helpful to have a list of contact forms to get Facebook support. Well... that's why I wrote in this post! Most social networks have a few contact forms for users to report issues. Facebook, on the other hand, has over 100 contact forms for just about every problem you could run into while using Facebook. Facebook has over 100 forms for just about every problem you could run into on Facebook. I organized the links by category and included a description or directions for each form (some forms are listed more than once if they fit in more than one category). Access Restricted (Bad IP) - You are trying to access Facebook from an IP (Internet Protocol) address that's associated with a misconfigured ISP (Internet Service Provider) or abusive behavior. If you think this is an error, please tell Facebook more. Accessibility for People with Disabilities - This form is dedicated to issues specific to accessibility and assistive technology. Account Disabled - Ineligible - Only submit this form if your account was disabled for violating Facebook's Statement of Rights and Responsibilities. If you can't access your account for a different reason, please return to the Help Center to find the appropriate contact channel. Facebook Ads API Standard Access Application - If your app is already approved for Basic access to the Ads API, you can use this form to apply for Standard access. Personal Data Requests - How to get personal data if you have an account, if you don't, or if you can't access it. Request Access to the Mobile Partner Portal - If you're a mobile operator employee, fill out this form to request access to the Facebook Mobile Partner Portal or report any issues you experience accessing the portal. For other issues, please use the Mobile Partner Portal case tool. Account Disabled - Ineligible - Please provide the following information so Facebook can look into your eligibility to use Facebook. Account Disabled - Multiple Accounts - If you are currently logged in to another person's Facebook account, please log out and then return to this form using your browser's back button. Account Disabled - Underage - Facebook requires all members to be at least 13 years old. Please provide the following information so Facebook can verify your age. Disabled Account Appeal - ID Request - In order to reactivate your account Facebook needs to verify your identity. Impostor Account - Directions on how to report impostor profile on Facebook. My Personal Account is in a Special Memorialized State - Form when you can't login to your Facebook account because it has been memorialized. My Personal Account was Disabled - If you believe your account was disabled by mistake, enter the following information so Facebook can investigate. Report a High-Priority Impostor Account - Please list the web address (URL) for each Timeline you're reporting. Report an Impostor Account - If someone created a Facebook account that's pretending to be you or someone you know, please use this form to file a report. Ads Pending Review - Help form for when an ad has been pending for more than 24 hours. Ads Billing Inquiry - Support for specific charges, managing ads, using a coupon, and payment methods. Facebook Ads API Standard Access Application - If your app is already approved for Basic access to the Ads API, you can use the form below to apply for Standard access. Facebook Ads: Overview and Tips - Questions in regards to costs and paying for your ad, improving ad performance, success stories, disapproved ads, or other ad issues. Request Help with Your Child's Ads Settings - Verify that you're a parent or guardian to get help changing your child's setting for pairing their name with ads. Child Data Request - Obtaining account information for a child before the account is deleted. Report an Underage Child (South Korea & Spain) - If you believe there is a child under the age of 14 using Facebook, please use this form to file a report. Report an Underage Child - If you believe there is a child under the age of 13 using Facebook, please use this form to file a report. Copyright Report Form - Use this form to report content which you believe violates or infringes your copyright. Reporting a Violation or Infringement of Your Rights - Reporting copyright, trademark, or other infringements. Trademark Complaint Inquiry Form - Use this form if your content was removed due to a complaint of trademark infringement and you believe this content should not have been removed. Trademark Report Form - Use this form to report content which you believe violates or infringes your trademark. Account Removal Request - Account removal request for someone who is sick, injured or otherwise incapacitated. Memorialization Request - Please use this form to request the memorialization of a deceased person's account. Facebook extends their condolences and appreciates your patience and understanding throughout this process. Note: Under penalty of perjury, this form is solely for reporting a deceased person's timeline to be memorialized. Requesting Content From a Deceased Person's Account - Please use this form to request content from a deceased person's account. Facebook extends their condolences and appreciate your patience and understanding throughout this process. Special Request for Deceased Person's Account - Please use this form to request the removal of a deceased person's account or for memorialization special requests. Facebook extends their condolences and appreciates your patience and understanding throughout this process. Didn't Receive Confirmation Email - Please fill out this form if you're having trouble confirming your Facebook account. Make sure to describe things exactly as they appear on your account. Email Address Already in Use - If there's already a Facebook account associated with your email address and you don't own that account, please use this form to let us know. Email Address Already Taken - If you see a message saying you can't create a Facebook account because your email address is already taken, please let us know. Give feedback or report that something is broken: Photos - Something is broken or general feedback for Photos. Page Post Targeting Feedback - Let us know what you think about Page post targeting. Report a Problem or Provide Feedback Regarding the Facebook Local Currency Migration - Thanks for taking the time to submit a report. We won't reply to every report, but we may contact you for more details about the issue as we investigate. Your Feedback About Facebook - Let us know how we can improve your experience with Facebook. Your Feedback About Facebook for Every Phone - Let us know how we can improve your experience with Facebook for Every Phone. Your Feedback about Pages Insights - Let us know what we can do to improve your experience with Pages Insights. Your Feedback About Promoted Page Likes - Report issue with Promoted Page likes or suggest feedback. Your Feedback about the Help Center - Let us know what we can do to improve your experience with the Help Center. Instagram - Distorted / Pixelated Image - If you're receiving a distorted or pixelated image, please fill in the form below. Instagram for Android - Black Images - We are aware of an issue where images on Instagram appear as a black or grey square on some devices. To help us identify this issue on your device, please fill out the form below. Report a Photo or Video for a Violation of Your Privacy Rights on Instagram - This form is reserved for people to report potential violations of their privacy rights concerning their image on Instagram. Instagram Requiring Login Every Time - If Instagram is logging you out every time you are exiting the app, please fill in the information below. Must Login To See This Page Error - If you're seeing this error message while browsing Facebook, you've come to the right place. Please use this form to tell us about the issue you're experiencing. Profile Pictures on the Login Page - Please use this form to request the removal of your profile picture from the Facebook login page. Report a Login Issue - If you're having trouble logging in or with your password, you've come to the right place. Please use this form to tell us about the issue you're experiencing. Security Checks Preventing Login - If you're having trouble logging in to your account due to security checks, you've come to the right place. Please use this form to tell us about the issue you're experiencing. Facebook Home: Mobile OEM and Operator Interest ... - If you are a mobile OEM or operator interested in partnering with Facebook, please let them know the best way to contact you. Report an Issue with Facebook Mobile Texts - If you're having trouble with Facebook Mobile Texts, you've come to the right place. Please use this form to tell Facebook about the issue you're experiencing. Report an Issue with Facebook on Mobile - Use this form to report any issues you experience while using Facebook on your mobile device. Changing Your Language-Specific Name - Provide information so Facebook can confirm that your language-specific name is your authentic name. My Name Wasn't Accepted - If you were unable to sign up for Facebook using your authentic name, please fill out the form below so Facebook support can help get you set up. Verify Your Name - Facebook support has temporarily suspended your account because they detected that your Timeline doesn't show your authentic name. Please provide the following information so support can verify your authentic name and update your account. Must Log In To See This Page Error - If you're seeing this error message while browsing Facebook, you've come to the right place. Please use this form to tell Facebook about the issue you're experiencing. Page Admin Security Check - If you weren't able to complete the Facebook online security check, you can confirm that this is your account by sending Facebook a copy of your ID. Page Post Targeting Feedback - Let Facebook know what you think about Page post targeting. Report an Issue with Home Page or News Feed - If you're having trouble with your home page or news feed, use this form to tell Facebook about the issue you're experiencing. Request for Community-Created Page Review - If you think your Page has been wrongly categorized as a Community-Created Page, Facebook will be happy to review the decision. Please note that the Page itself has not changed. It is still on Facebook and fans can still interact with it as always. Your Feedback about Pages Insights - Let Facebook know what they can do to improve your experience with Pages Insights. Facebook Payments Support - Issues with ads, promoted posts, games, gifts, donations, and news feed purchases. Facebook Payments - Developer Payout Registration - Registration to receive payments for apps. Privacy Rights - Photo Removal Request - This channel is reserved for people to report potential violations of their privacy rights concerning their image on Facebook. Privacy Rights - Photo Removal Request - Please use this form to report a photo that you believe violates your country's privacy rights. Profile Photos on the Login Page - Please use this form to request the removal of your profile picture from the Facebook login page. Privacy Rights - Video Removal Request - This channel is reserved for people to report potential violations of their privacy rights concerning their image on Facebook. Report an Issue with Webcam Videos on Facebook - If you're having trouble recording webcam video, use this form to tell Facebook about the issue you're experiencing. Report a Privacy Rights Violation - Please note that this channel is reserved for people to report potential violations of their privacy rights concerning their image on Facebook. Some contact forms have multiple options. Depending on the option you select, you'll be shown the actual form or redirected to related contact forms or additional information. If you notice there are 2nd or 3rd options (i.e., duplicate forms for the same issue), submit those as well as the originals. Another way to get help with Facebook issues is to connect with other users in the Facebook Community Forum. You can browse questions by topic or use the search box at the top of the page. If you find a question similar to the one you want to ask, and it's still active, then you can add details about your issue to help others working on the same problem. If you only find old or closed threads, you can use the Ask a Question button to post a new question. 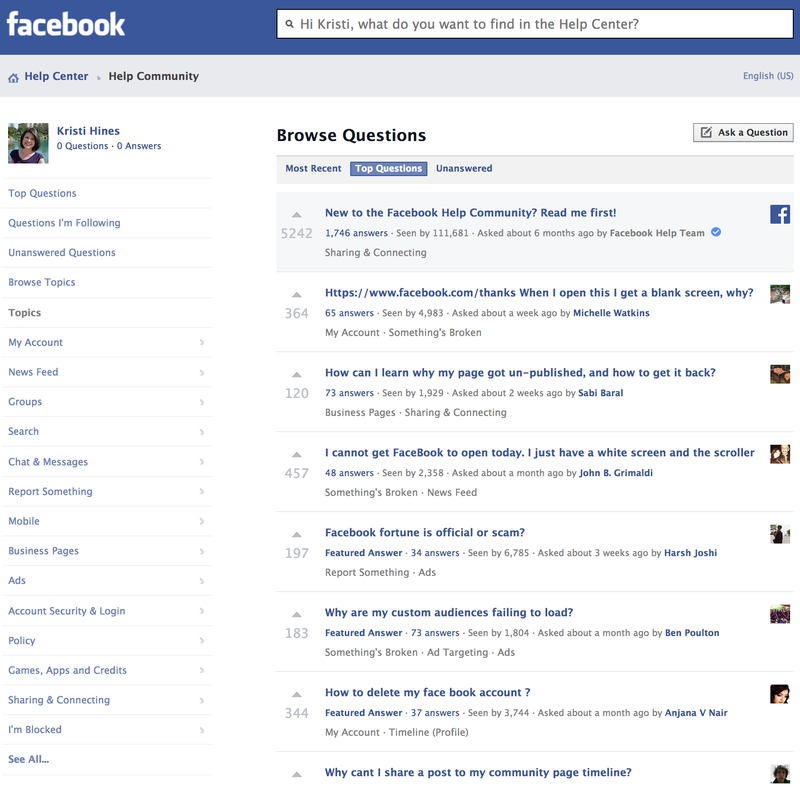 For those looking to establish themselves as experts in the Facebook community, browsing the unanswered questions section will give you opportunities to help others. There are several official Facebook pages. Some of which are not only posting updates, but also replying to comments from the community. Stay connected with the following pages and be sure to jump into conversations when there are posts related to topics you have questions about. Facebook - Facebook Page celebrates how our friends inspire us, support us, and help us discover the world when we connect. Facebook for Business - Facebook for Business provides the latest news, tips and best practices to help you meet your business goals. 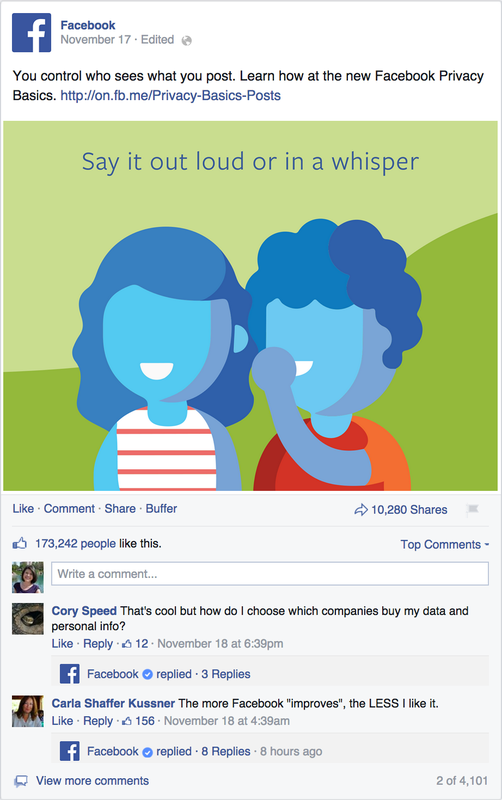 Facebook & Privacy - Like this Page to learn how to exercise your choice to share what you want with those you want, keep up with changes, and talk with others about the importance of privacy in our digital age. Facebook Media - Explore how public figures and media organizations are using Facebook in extraordinary ways. Facebook Design - Get to know the designers, content strategists and researchers who shape your experience on Facebook. Facebook Developers - Build, grow, and monetize your app with Facebook. Facebook Engineering - They build Facebook. For those looking to establish themselves as experts in the Facebook community, watch for questions on posts by the official Facebook pages and jump in to answer them when you can. When you have a problem, I suggest taking multiple avenues to get it resolved. If you submit the appropriate contact form on Facebook, ask the official Facebook Help Center Community, and start a discussion on a relevant official Facebook page post, you'll likely get the support you need. Be sure also to tap into resources outside Facebook, such as Facebook user groups on other networks and people you know that are Facebook savvy. What do you do when you have a problem on Facebook? Please share in the comments!